Dayton Geothermal Hydronic Heat Pumps | Danco Enterprises, Inc. The 5 Series represents some of our best features and efficiencies. Its advanced components offer a level of comfort and savings that’s far greater than any ordinary system and among the geothermal industry’s highest. The 502W12 High Temperature Hydronic Heat Pump is our geothermal solution for boiler replacement. Capable of delivering 150°F leaving hot water, this system is perfect for baseboard radiator systems, under floor radiant applications, over floor radiant applications, and fan coils. Typical geothermal hydronic systems are limited to water temperatures around 130°F which can make replacing fossil fuel boilers difficult. This system has been designed specifically to meet these higher temperature requirements and makes upgrading to a WaterFurnace system easier. 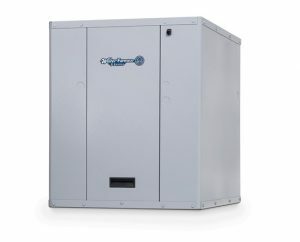 It utilizes low-pressure environmentally friendly R-134a refrigerant along with high efficiency top-notch components. The 5 Series upholds the standards we’ve set over three decades and the trust associated with the WaterFurnace name. Every unit is computer run-tested to ensure flawless performance at start-up – and in the unlikely event of a malfunction, they’re backed by the best warranties in the industry. Choose a geothermal system that’s Smarter from the Ground Up.